Black 1 in the diagram is an example of a slide (in a joseki that is known as catenaccio). On the other hand, this kind of slide by Black is often criticised. It is an example of a sente play that may often be better left unplayed. 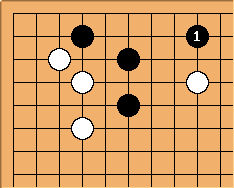 The presence of the marked stone means that Black's group is weak. The exchange of Black 1 and White 2 makes it heavier. No longer can Black invade at White 2 to dodge the attack. The easiest kind of slide to understand and handle is the knight's move slide, from the marked stone to the point a. The longer slides to b, c, d are useful techniques (examples of haengma), but involve weaknesses. You might say that the slide to d is so tenuous as not to be any kind of connection. In professional games it is often the case that after a longer slide the shape becomes fixed quite soon. This is an example from current play of a slide used to handle a position on the side, which was in danger of becoming cramped. White's aim with the slide is to avoid this sequence, in which the marked stone is too close to the white two-stone wall. Bob McGuigan: The Japanese term suberi has become an alias for this page but suberi is also used to describe slides from the second line to the first line. e.g. monkey jump (sarusuberi). Is the definition of slide above too restrictive? 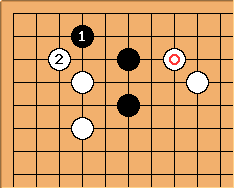 Bill: The Go Player's Almanac equates slide, suberi, and hashiri. There is no distinction between sliding to the second line vs. sliding to the first line. It also says that it is a knight's move. So the extra long slide -- is not.